1 September 2012, was the centenary anniversary of the death of Samuel Coleridge-Taylor. Below is the appreciation of Coleridge-Taylor, man of music and protagonist for equality, which I wrote to mark this significant milestone for the Huffington Post UK, along with a reiteration also of the appreciation which William Zick of the AfriClassical (USA) website has posted on that site. You, the reader, are also most welcome to add as a Comment (below) your own contributory link to this post, in appreciation of Samuel Coleridge-Taylor and his enduring legacy. Admirers of the music of Samuel Coleridge-Taylor and visitors to the Foundation website will undoubtedly be aware of the enormous contribution made by Patrick Meadows towards rescuing SC-T’s music from the relative (and undeserved) obscurity into which it had fallen. Patrick’s own ‘interview with myself’ posted elsewhere on the site describes how he came to be involved with publishing those works which had never before been printed or which, in the case of Thelma, was believed lost until Catherine Carr turned it up. Two Autumn 2012 events in London (on Friday 5th and Tuesday 16th October) will commemorate the centenary of the death of Samuel Coleridge-Taylor, with speakers from the SCT Foundation presenting their findings on the composer’s life and works. Samuel Coleridge-Taylor died 100 years ago, aged 37. He was born to an English mother in London and a doctor from Sierra Leone. To mark this special anniversary, hear a newly commissioned celebration and talks and excerpts of Coleridge-Taylor’s music, led by prominent and talented artists, scholars and historians who will pay tribute to his musical genius. Insight on Coleridge-Taylor – Featuring the musicians, poets, speakers from the evening, with audience Q&A. Jointly organised with the Royal College of Music, The Books Project and the Samuel Coleridge-Taylor Foundation. With special thanks to Black Cultural Archive and Historian Jeffrey Green. of the Samuel Coleridge-Taylor Foundation, to mark the centenary of the composer’s death in the street of his birth. Daniel Labonne, an SCTF Patron and founder of the original Samuel Coleridge-Taylor Society back in the 1990s, has published a book, Empowering The Performer, which draws on his experience of setting up an arts organisation in Africa. Here Daniel Labonne describes ‘Six Reality Checks Behind A Book’, explaining how he came to set up a regional centre for performing arts in southern Africa, and some quarter century thereafter his charity, FACE (The Foundation for Arts, Creativity and Exchange) and to write the book he has just published, Empowering The Performer. As we reach the centenary of the final birthday, on 15 August 1912, of Samuel Coleridge-Taylor (1875-1912), the Samuel Coleridge-Taylor Foundation and HOPES: The Hope Street Association are pleased to announce that recently they jointly commissioned a Nonet, with the same instrumentation as Samuel Coleridge-Taylor’s own Nonet in F minor, op. 2* (1895), from the composer Richard Gordon-Smith. 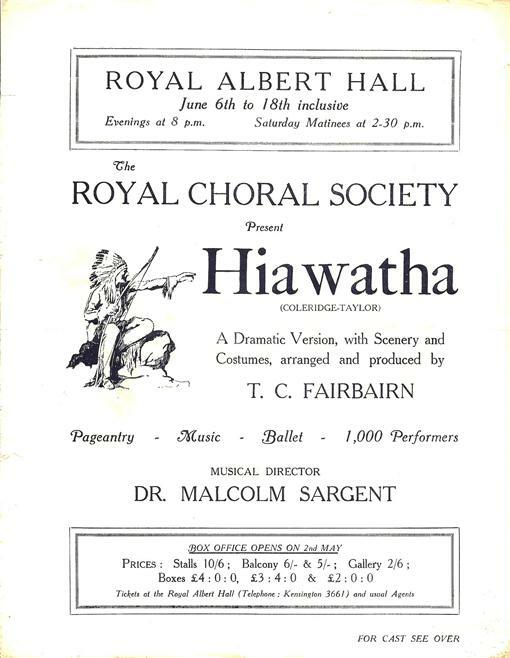 Two of our readers have recently very generously sent us material relating to the Hiawatha performances at the Royal Albert Hall in years around the 1930s. We are grateful to George Parnell for this Programme of Hiawatha performances, and to Wendy Breese for sending us her recollections of time in the Royal Choral Society. Sir Malcom Sergent of course features in both these items of memorabilia. 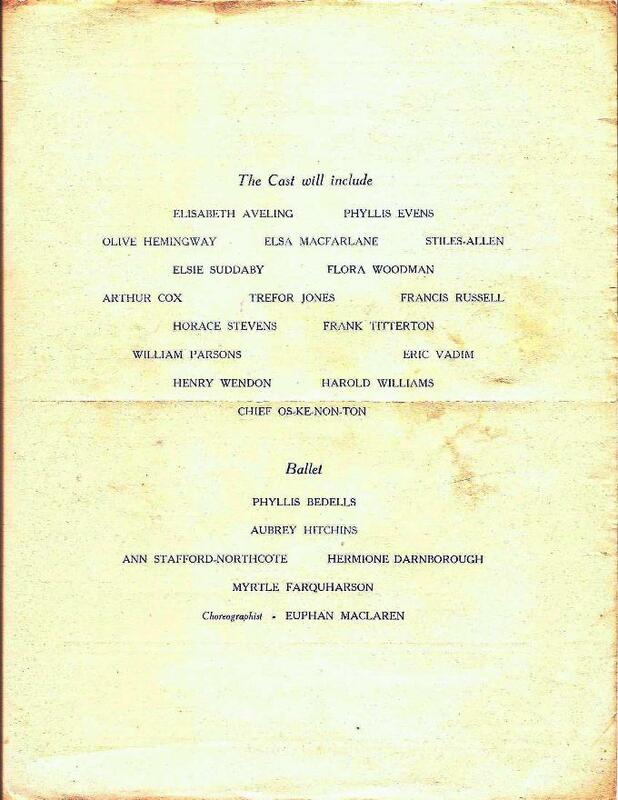 My mother and grandmother were members of the Royal Choral Society and took part in costumed performances of Hiawatha at The Royal Albert Hall. When we were old enough my sister and I also joined the Royal Choral Society, and sang alongside our mother in the altos. Our grandmother had retired from the choir by then so we were never all four together. We also made a 12″ LP recording of Hiawatha at Maida Vale studios, conducted by Sir Malcolm Sargent.